A new addition to the Fujifilm X family! A big part of being a Fujifilm X Ambassador is to periodically test some of their new cameras before release. The excitement that comes with being associated with such a forward thinking company is a privilege. When testing new equipment we are using unfinished pre-production cameras, with unfinished firmware and as such Fujifilm are constantly requesting feedback and ideas for updates and always receptive to suggestions. This is why Fujifilm have now carved their way into converting many photographers from the mainstream brands including myself. 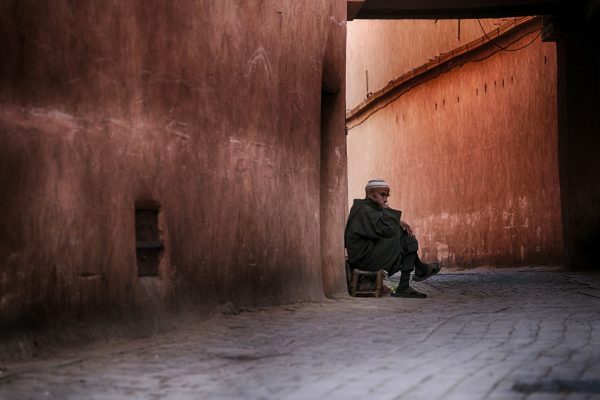 Being a travel and portrait photographer Fujifilm were keen for me to test their 4th generation X camera, the new Fujifilm X-T3 in the field, and the wonderful city of Marrakech was chosen to see what the camera was really capable of. Morrocco, and a new country for me! I have always loved visiting new places and Marrakesh was somewhere that I had never been before, people had told me of the colourful markets and the vibrancy of the city and they were right! The energy of the city was a real treat for the senses; the colours the smells, the food were all just incredible. The HEAT, that HEAT however was just unbelievable! I think it reached over 40 while we were there, I think even the locals were getting a little bit British regarding the weather. As with most countries I visit, I had done some research beforehand and after reading many blogs and guides I was under the impression that it would be difficult to take images of the locals as they would be resist due to their religion. This resistance became very apparent on the first trip out with the kit. 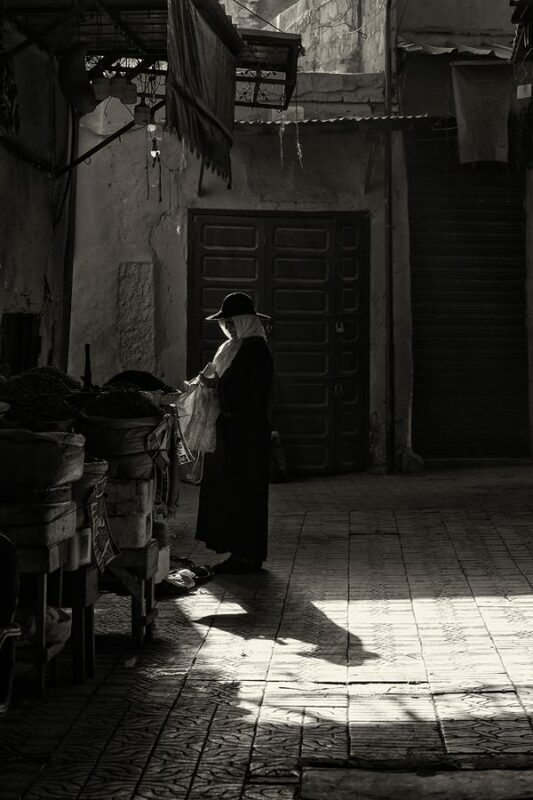 A sample of some of the images that were taken in Marrakech whilst using the Fujifilm X-T3. Marrakech is certainly not for the first time portrait photographer, you need a thick skin and be prepared to be shouted at from every corner! The Morrocans’ seem to have a sixth sense for a photographer, with hand gestures and expletives flying all over the place, it was hard to capture my normal style of natural, honest portraits. Half way through the shoot I questioned why on earth we had chosen to come here? However undaunted and with perseverance I believe I captured the essence of the city and its characters as they are the heart and soul of what makes a place interesting. And if people were not going let me take their portraits directly, I would use my skills to try and let that come across in my imagery, as obviously it becomes part of the culture that I am trying to illustrate to the viewer. When visiting a new country I am struck by the unique colour palette. In Nepal it was the blues, in Tanzania it was the lush greens and in Nicaragua the vibrant reds. I will always try to give the sense of that colour in the images. 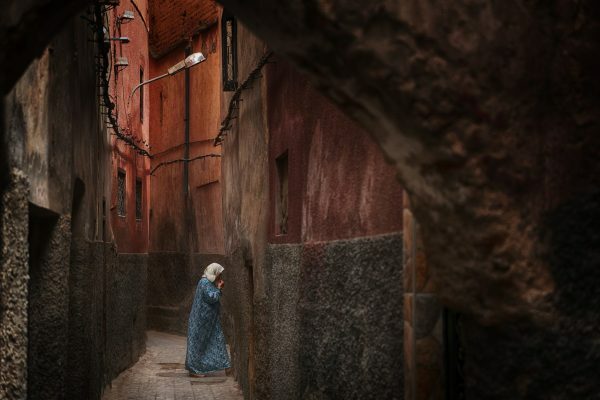 In Morroco it was the warmth of the oranges and pinks in the architecture surrounding us with the beautiful contrasts of blues in the clothing. With no sleep we arrived at 11 in the morning for what was going to be an intense few days, and decided to head out immediately. 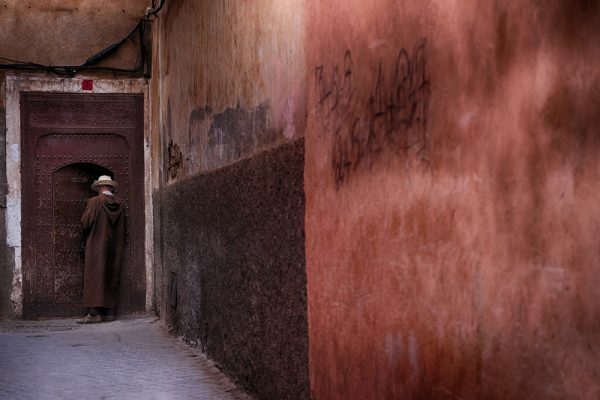 We were based at Riad Andalla perfectly located to explore the centre of the hustle and bustle, with meandering corridors and shaded market hallways. We explored until our feet ached and pretty much found all the locations for the shoot away from the main market square, or the tanners yard (which everyone was helpful enough to direct us back to every 5 minutes!) I will always try and find the REAL sense of place rather than heading straight to where he tourists go. 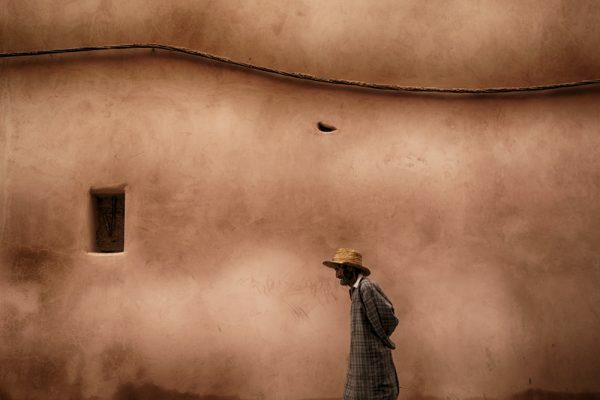 I endeavour to capture how the locals live, their lifestyle rather than a fake representation. Authenticity is what I will always try and capture. OK, so I know what you’re thinking, what about the camera? After the X-T2 and the X-H1? What else can Fujifilm give us? (I thought the same!) I have been so happy with my existing kit I wasn’t too sure what else they could add to the mix. However with Fujifilm they always manage to move forward with new innovations and extras and once tried you never want to be without. The X-T3 is certainly more responsive, the new sensor, a back-illuminated 26MP X-Trans CMOS 4 sensor and X-Processor 4 image processing engine, I am sure is the reason for this. It really is noticeable, especially when shooting the way I do, constantly following moving subjects and trying to anticipate the constantly evolving scenes around me. We were also shooting in some pretty low lighting conditions, and the focussing was still as responsive, not being a technically savvy photographer (I just know what I need to know) I am not going to pretend to understand how it all works, I just know it does. The X-T3 has even more focusing points, 425!! Which for me is brilliant for dynamic composing. I now always use the joystick to focus rather than focus and reframe, for me this is far more accurate, and enables me to place my subject exactly where I want them within the frame. The colours of the new profile ETERNA/ Cinema are just gorgeous and have a film like quality as the name suggests. The colours that you receive are more vibrant with minimal editing, so I am a happy photographer out shooting beautiful portraits rather than sitting in front of a lonely editing screen. The feel of the camera is much the same. However one difference I felt was the hand grip on the right of the camera is more ergonomic and fits the hand better, especially useful when the larger lenses are mounted, I tend to use the 50-140mm lens as my go to, so this did feel better. The weight is the same which is a good thing travelling as I do, I managed to catch a cheaper flight, even with all of my kit and 3 days of clothes I managed to pack everything in my trusty Billingham bag. I certainly couldn’t have done that before! It was easy and fast to just get off the plane, and get ready to shoot as we were under such a tight time constraint. The trip was wonderful, if not a little challenging, the heat, the avoidance of willing subjects, and the timescale was always going to be an issue. However in true style we managed to get what we needed. I really do appreciate my life and how lucky I am! What a gift to be able to travel to some amazing places just because I’ve got a camera in my hand! And with The X-T3 it will be even more exciting! I don’t think Moroccans are resistant to photography due to religion. 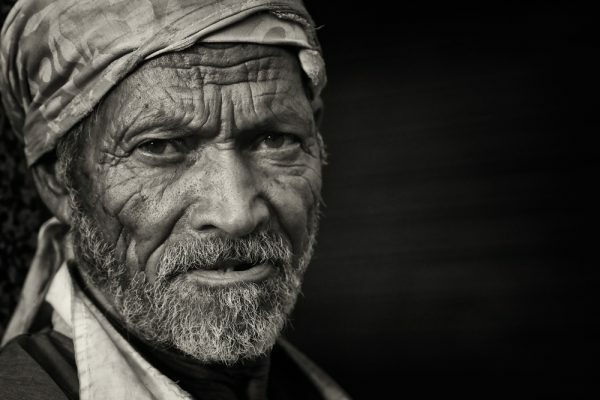 I have traveled all over the Muslim world and in general people are open to photography. 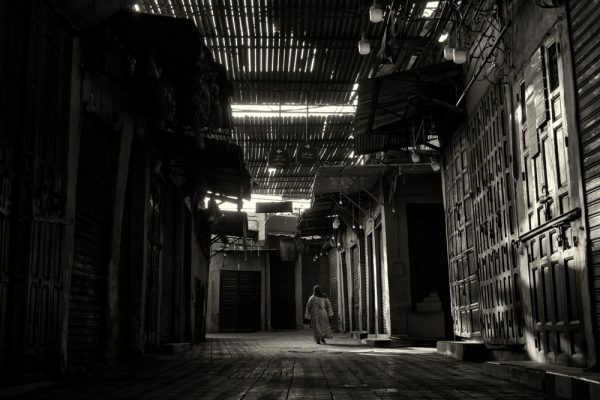 However, I too had issues shooting in Marrakech and I think it is the general attitude of the locals. In my experience, they wanted money and were tired of all the tourists. In spite of that, I think you got some nice photos here. Thanks for sharing.